Hurricane Ivan slammed ashore early Thursday with winds of 130 mph, packing deadly tornadoes and a powerful punch of waves and rain that threatened to swamp communities from Louisiana to the Florida Panhandle. At least 12 deaths were blamed on the storm. For the millions of Gulf Coast residents who spent a frightening night in shelters and boarded-up homes, the worst could be yet to come: up to 15 inches of rain were expected as Ivan moved inland. "Say a prayer, say a prayer, say a prayer, that I'll have some place to go when I leave here," evacuee Betty Sigler said in a Mobile, Alabama, shelter, safe from the howling wind and sheets of rain. "We'll see in the morning." Up to 15 inches of rain was expected as the storm moved inland. It remained a Category 1 hurricane with wind of 75 mph eight hours after its 2 a.m. CDT landfall before weakening to a tropical storm. At 1 p.m., its sustained wind speed was 70 mph. Ivan knocked out power to hundreds of thousands of people, toppled trees, ripped off roofs and sent street signs hurtling through the night. In the beach resort town of Gulf Shores, where the storm's eye blew ashore, the sky had a bright green glow as electrical transformers blew. "We have never seen a hurricane of this size come into Alabama," said Gov. Bob Riley, who earlier asked President Bush to declare much of the state a disaster area, a request that was granted. Two people were killed and more than 200 homes were damaged when at least five tornadoes roared through Florida's Bay County. Five people were killed when another tornado struck homes in Blountstown, Florida, and an 8-year-old girl died after being crushed by a tree that fell onto her mobile home in Milton, Florida. Her parents were unharmed. Four Pensacola, Fla., hospitals reported major damage due to Ivan, CBS News correspondent Peter King reports. No patients were reported injured at any of the hospitals according to officials. Hospital workers were able to move patients away from danger. Pensacola Mayor John Fogg said he has no details about the hospitals, but knows that the hospitals have been damaged and that major damage exists throughout the area. "This couldn't be much worse," Fogg said. "It's a disaster for our county and our city. We thought it was going to be pretty bad, but this has just turned out to be awful." Four ailing evacuees — a terminally ill cancer patient, two nursing home patients and a homebound patient — reportedly died after being taken from their storm-threatened south Louisiana homes to safer parts of the state. Max Mayfield, the director of the National Hurricane Center in Miami, warned that the misery would spread as Ivan moves across the Southeast in the hours and days ahead. "I hate to think about what's going to happen inland," he said. A hurricane warning for New Orleans was lifted early Thursday, but one remained in effect from the mouth of the Pearl River to Apalachicola, Florida. Hurricane-force winds extended out 105 miles from the Category 3 storm that earlier killed at least 68 people across the Caribbean. National Hurricane Center forecasters said land east of where Ivan's eye passed was experiencing storm surge of 10 to 16 feet, topped by large and dangerous battering waves. "We've had calls from folks saying, 'The water is rising, can you come get me?' Unfortunately we can't send anybody out. The storm is at its worst point now," said Sonya Smith, a spokeswoman for Florida's Escambia County emergency management agency. An 11th-hour shift spared New Orleans a direct hit. Parts of the city saw only sporadic, light rain overnight. That same shift was bad news for the Gulf Shores and Orange Beach areas in Alabama, reports CBS News correspondent Lee Cowan. That area is reported to be in shambles. 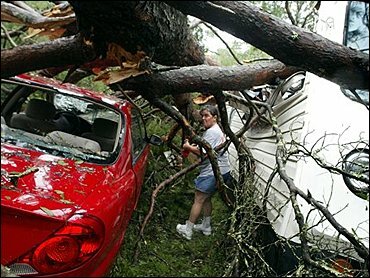 But Mobile, Ala., for the most part was spared. The city seems to have dodged a bullet, Cowan reports. At least 260,000 homes and businesses were without power in Alabama, 36,500 in Louisiana, 50,000 in Mississippi. More than 300,000 customers were without power in the four westernmost Florida Panhandle counties. Florida was still trying to restore power to about 160,000 hit by Hurricanes Charley and Frances in recent weeks. Ivan's waves — some up to 25 feet — destroyed homes along the Florida coast Wednesday. Twelve-foot waves boomed ashore at Gulf Shores, eroding the beach. A buoy about 300 miles south of Panama City registered one wave of 50 feet high. In Fort Walton Beach, Florida, a nursing home lost its generator power and reported that six patients desperately needed oxygen. An emergency medical crew drove through the 90 mph winds to deliver portable oxygen tanks. Mayors of the Alabama communities of Gulf Shores and Orange Beach refused to allow anyone back until further notice, fearful that returning residents weren't safe among downed power lines and weakened buildings, said county EMA spokeswoman Colette Boehm. Gulf Shores Mayor David Bodenhamer said streets were flooded and trees and power lines were down everywhere. His home and others along the beachfront road were OK, "But the beach is going to be a mess, a big mess," he said. New Orleans had scrambled to get people out of harm's way, putting the frail and elderly in the cavernous Louisiana Superdome and urging others to move to higher floors in tall buildings. Of the roughly 2 million who fled the path of the storm, often in bumper-to-bumper caravans on highways turned into one-way evacuation routes, 1.2 million were from greater New Orleans. Thousands of tourists were believed stranded in New Orleans, along with 100,000 mostly inner-city residents without cars. Forecasters said hurricane-force winds could blast the coast for nearly 20 hours. The National Weather Service issued a flood watch for as far away as North Carolina, which suffered heavy flooding last week from the remnants of Hurricane Frances. The heavy rain also could trigger mud and rock slides. More trouble lingered out in the Atlantic. Tropical Storm Jeanne became a hurricane Thursday in the Caribbean as it moved westward across the north coast of Puerto Rico with 80 mph winds. It could be near Florida's east coast as early as the weekend.